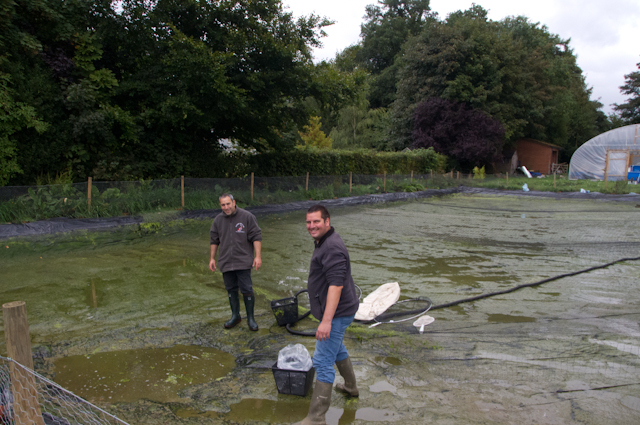 We harvested the fry ponds today, and overall - ok on the size of the fry harvested considering the time of year and the number of weeks since spawning . But, not quite what we hoped for volume wise. We harvested only a few hundred shusui, and it really should have been a few thousand. I lost a lot of hatchlings in the spawning vat through poor water quality, and the fry pond water hadnt cycled into the rotifer stage early enough and there was probably a food shortage early on. What we have harvested looks interesting and I'll know more once the selections are done. In the other pond - there were some showa; not many which is as I expected becausse I didnt have many showa hatchlings to put in. The biggest disappointment today was the number of kohaku. 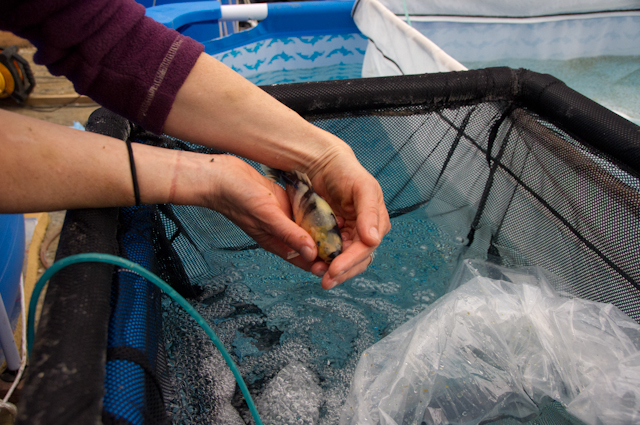 A few weeks ago, observations suggested several thousand kohaku fry and we've pulled out only around c.1k today. Speaking to Mark Davis today about why the numbers seem to have dwindled over the last few weeks and mentioning the Loch Ness Shiro's - he suggested they could be responsible for eating through several thousand which would explain it. Gutting! The bigger of the two is 16.5cm, and it's only 3 and a half months old! They have grown large on a diet of dahnia and live koi! The other one is around 1 cm smaller. The good news is it shows the parent set can produce good growers, the bad news is I inadvertently sacrificed probably 80% of my kohaku spawning! 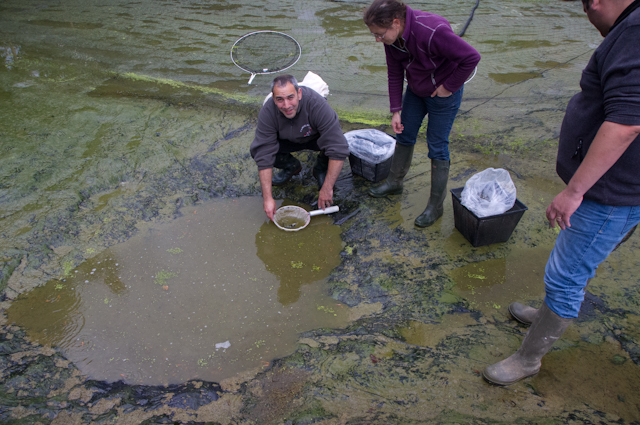 Seeing the number of kohaku fry diminish over the last 2 or 3 weeks was a big driver to harvest the ponds as soon as possible, and as the fry are around 1inch it thought it prudent to whip the lot out and separate them from the Loch Ness Shiro's. Making the decision to harvest early has saved more from being eaten by the Shiro's. - there are enough kohaku's for me to compare this parent set against the early summer spawning kohaku set, where I used the same males with a different female. This is a silver lining - and very important to help me prep for next year. - the kohaku growth was really good; they are larger than the shusui and the same size as the showa - but they are 1 week younger! They achieved 1inch size faster than I expected - this could be partly to do with good fry pond conditions, but it also bodes well for the parent set combination. 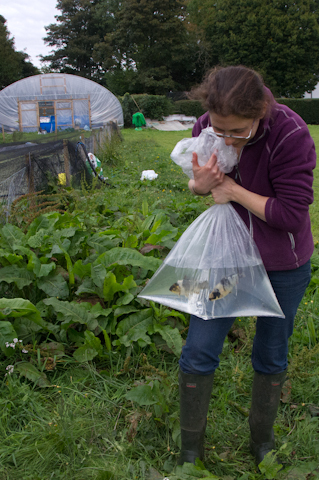 - Loch Ness Shiros' size shows I can achieve good hatchling growth in my ponds, given the right diet and availablility of food. - I have some showa and shusui, so can start to learn about selecting through those varieties; again helping me to prep for next year. And you never know, I might get luck with some of them. - I have harvested 4 spawnings this year from 2 fry ponds; both early summer and both later summer spawnings were harvested and that's good going considering it's my first year - literally starting from scratch. Volumes could have been better, but I can take positives from the fact there are some koi harvested from each of those 4 spawnings. I feel confident that next year I will start to capitalise on that experience, make less mistakes and start to achieve harvests in the 10's of thousand at 1 inch size. And this is where I need to be to stand a chance of breeding some koi that could achieve my project objective. With three good quality and good size kohaku females ready to spawn next year - the prospect of spawning all three is exciting. - having produced only 4500 fry to 1inch size this year, there is only an outside chance of achieving my project objective in 2014. - the Loch Ness Shiro impact has been a huge disappointment. Many thanks to our friends Mark, Amanda and Paul who helped with the harvests. 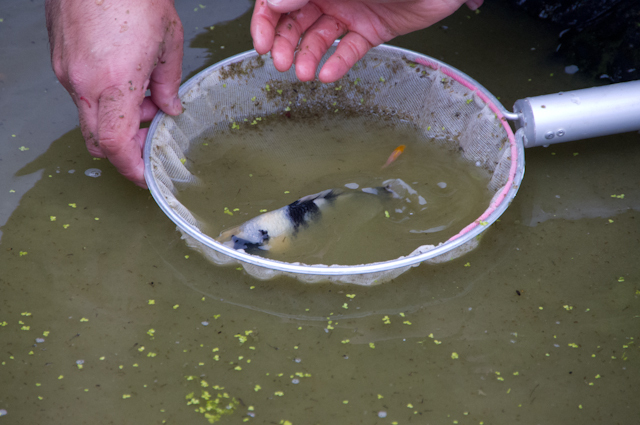 The pond drained down, with koi fry gathered in the lowest pool. Celebrations as the Loch Ness Shiro is captured! Catching the final few out with this piece of "fryII" netting. Not sure what we're going to do with the Loch Ness Shiros now. The project set up work is ongoing. I have another tank to install so I can split the 1inch koi from the 3-4 inch keepers. And, I need to plumb in a heater, insulate the growing on tanks etc etc. At the moment, water temps are below what I want so I'm losing growing time. The 3-4inch keepers are doing well, and I'll try and get some up to date pictures soon. The larger ones have reached around 5 inches.